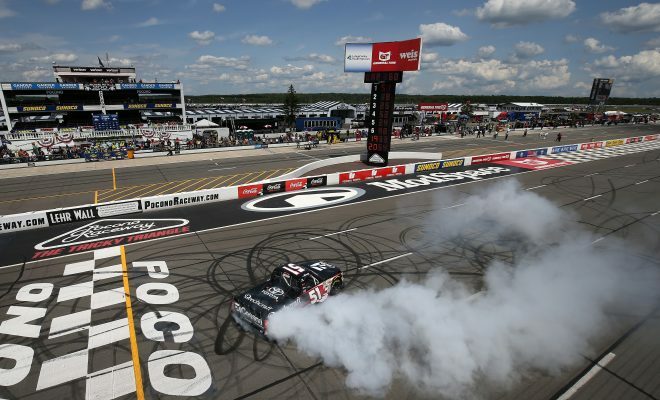 (NASCAR Wire Service) LONG POND, Pa. – In his last start of the season, Kyle Busch got the NASCAR Camping World Truck Series victory he coveted most. 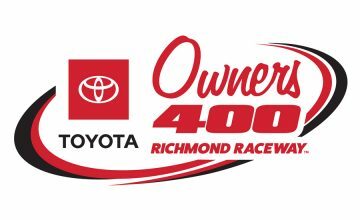 Holding off a charge from Kyle Busch Motorsports teammate Erik Jones—who started the race in place of ailing Noah Gragson—Busch, the pole winner, powered his No. 51 Toyota across the finish line 1.469 seconds ahead of Jones’ No. 18 to win the Gander Outdoors 150 at Pocono Raceway. The number “51” had added significance on Saturday. In winning for the second time in five starts this season and the second time at the 2.5-mile “Tricky Triangle,” Busch collected the 51st NCWTS victory of his career, tying him for the all-time series lead with NASCAR Hall of Famer Ron Hornaday Jr.
Busch’s milestone triumph, however, was in doubt until the closing laps. On Lap 52 of 60, Jones caught Busch in heavy race traffic and pulled ahead as the trucks rounded Turn 1 and headed down the Long Pond straightaway. But Busch regained the lead through the Tunnel Turn, powering to the outside of Jones, whose Tundra was slowed by a lapped truck. From that point, Busch pulled away for the victory. When Busch did his celebratory burnout on the front stretch, two patches of rubber deposited on the racing surface caught fire. Busch grabbed the lead from eventual third-place finisher Dalton Sargeant on Lap 37, with Jones running third at the time. It took Jones four more laps to get past Sargeant, as Busch opened a lead of more than two seconds. But Jones, who won the 2015 series championship in a KBM truck, ate into the gap steadily and had his one shot at the win on Lap 52. “We came within about six inches of doing it, and I had to kind of checkup. There were four lapped trucks. We passed three of them on the straightaway, and there was one more in the Tunnel Turn, and I had to check up on the bottom or run him over, which I wasn’t going to do. Stewart Friesen finished fourth, followed by Justin Haley. Grant Enfinger, Todd Gilliland, Johnny Sauter, Matt Crafton and Joe Nemechek completed the top 10. Gragson was suffering from a stomach virus and wasn’t cleared medically to compete after a visit to the infield care center. 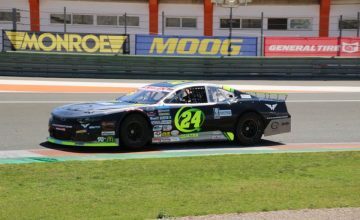 But Gragson will receive a medical waiver from NASCAR that keeps him eligible to compete for the series championship. With one victory to his credit this season, Gragson held on to second in the standings, 65 points behind Sauter.